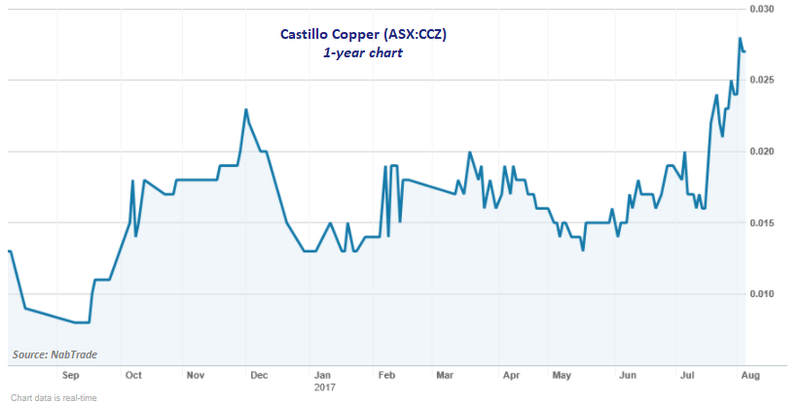 ASX explorer, Castillo Copper Limited (ASX:CCZ), has announced today that high-grade supergene ore, with copper up to 35%, has been discovered at the historic Cangai Copper Cobalt Mine. This discovery was made during the due diligence process on the company’s current acquisition of Total Minerals Pty Ltd. 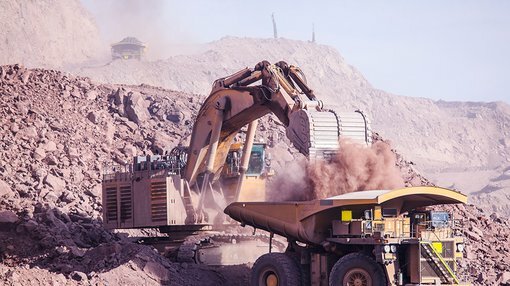 The process has verified that Total’s three complementary project areas in NSW and QLD are highly prospective for high-grade cobalt, copper and zinc. Mine records confirm that supergene ore occurred with azurite and amalachite ore, grading at 20% to 35% copper – this occurred close to the surface and passed into chalcocite ore, of similar grade, below surface. Crucially, supergene ore was present in both sediments and dykes. In addition, historic drill core from the mine (held by the NSW Resources and Energy department) has been inspected by Total Minerals’ consultant, ROM Resources, and is now being prepared to be assayed. These new assays, which are currently being analysed, will target high-grade cobalt, copper and zinc, and will assist materially with JORC Resource modelling. With this in mind, CCZ’s share sale agreement has been executed, and conditions are expected to be satisfied within five days. With due process now finalised, CCZ’s primary objective is to prove up three JORC compliant Inferred Resources as quickly as possible. Shares have been trading strongly for CCZ, up 93% in the last 12 months. In the wake of today’s development, the share price has surged 15%. CCZ’s strategic and timely acquisition doubles its mineralised footprint across NSW and QLD. Importantly, ROM Resources has confirmed that two JORC Resources for cobalt, copper and zinc can be modelled from legacy data at the Jackaderry South project area (which includes the historic Cangai Copper Cobalt Mine) and the contiguous Peak Hill/Total prospects. The map below shows CCZ’s tenements, including the recent acquisitions. 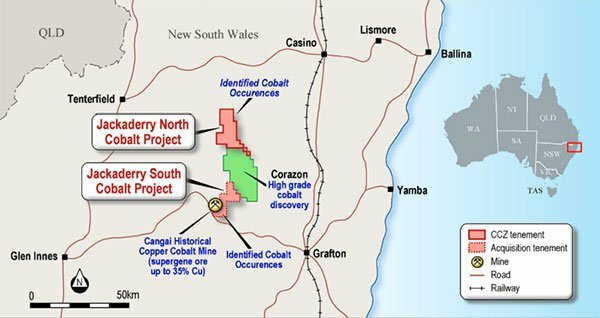 Particularly significant is the historic Cangai Copper Cobalt Mine (within the renamed Jackaderry South prospect), which resides in a region with known cobalt-copper systems. During the desktop review process, ROM uncovered historical analyses undertaken by CRA Exploration between 1990 and 1992 on samples of massive ore around Cangai, which indicates promising exploration upside to the Jackaderry South project. The presence of cobaltite in primary ore which explains materially elevated cobalt values in relation to other trace elements. As part of its drilled down due diligence to generate a JORC Resource from Jackaderry South, ROM will thoroughly test legacy core samples from Cangai for high-grade cobalt, copper and zinc. These new assays, expected in the coming weeks, will importantly assist the process to model a JORC compliant Inferred Resource for the Jackaderry South project area. Desktop reviews have also highlighted contiguous mineralisation at the Peak Hill/Total and Big Oxide North/Hill of Grace prospects. Significantly, this is likely to translate into a higher JORC-compliant Resource for cobalt, copper and zinc than originally anticipated, as the initial assessment was based only on the Peak Hill prospect area. The addition of Total’s project area effectively doubles CCZ’s mineralised footprint in the prime Broken Hill region. Additionally, ROM Resources has identified priority drilling targets for the Big Oxide North and Hill of Grace project areas in QLD, which show contiguous mineralisation. Upon completion of the inaugural drilling program, which will commence in spring, ROM believes a third JORC Resource for cobalt-copper-zinc can be generated. This means that CCZ will potentially have three JORC Inferred Resources across its project areas, which bodes highly favourably for the company. It’s also important to note that from a cost perspective, generating these will be relatively inexpensive, given two are from legacy data and only one is from a drilling campaign. Given the sturdy global outlook for all three commodities, CCZ’s immediate focus now is to review all geological studies for the six project areas, prioritise the exploration plan, progress JORC modelling for the NSW prospects, and speedily execute its business plan. The finalised acquisition terms stipulate that CCZ will issue the vendors 55,000,000 CCZ shares in consideration for all Total’s issued equity, and formalise an agreement for the vendors to receive a 3% net smelter return royalty in respect of the project areas.